The Sigma APO TELE CONVERTER 1.4x EX DG is a focal length extender, which as the name suggests, increases your lens's focal length by a factor of 1.4 times (or 40%). This make a 200mm lens function as a 280mm lens or a 300mm lens as a 420mm. The trade-off for gaining this extra focal length is a 1-stop loss in light. As such, your 200mm ƒ/2.8 lens is transformed into a 280mm ƒ/4 lens. Other factors to consider with teleconverters is that unlike other lens attachments such as extension tubes, teleconverters have extra lens elements and therefore can introduce some loss in image sharpness as well as magnify other lens issues like chromatic aberration. The Sigma APO TELE CONVERTER 1.4x EX DG comes in Canon, Nikon and of course Sigma mounts. For Canon and Nikon, it competes directly against these manufacturers' own 1.4x teleconverters: the Canon 1.4X Extender EF III and Nikon 1.4X AF-S TC-14E II. Overall, functionally similar to these teleconverters, the Sigma 1.4x extender is significantly less expensive at around $225 compared to the $450 and $499 price tags of the Canon and Nikon extenders, respectively. 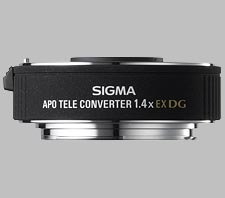 The Sigma APO TELE CONVERTER 1.4x EX DG ships with front and rear caps as well as a small carrying case and is compatible with both full-frame and sub-frame cameras. Sigma shipped the APO TELE CONVERTER 1.4x EX DG along with the Canon-mount version of their new 120-300mm ƒ/2.8 DG OS HSM "S" telephoto zoom lens, and we used that lens to test this converter. Without the extender, the new Sigma 120-300mm lens produced excellent results (check out our review). With the teleconverter attached, however, we ran into a strange issue with this lens accessory. Other than the expected reduced sharpness, we saw significant softness on the right side of the images wide open when using a full-frame camera (notice the difference here at 300mm ƒ/2.8 vs. 420mm ƒ/4). We requested a second and then a third copy of the teleconverter. The second copy showed similar results to the first one. The third copy behaved similarly, although it was the best of the three. To rule out any lens issues, we also tested the 120-300mm lens with a Canon 1.4X Extender II, and the results were much better. Excluding the slight loss in sharpness that comes with any teleconverter, we saw no right side softness with the Canon extender. We were eventually given a fourth copy of this teleconverter, which had a higher serial number than first three we tested. The first three has serial numbers that were all very close to each other. This fourth copy was by far the best one we tested, and it's the results we included in this final review. When you get a good copy, this telelconverter produces decently sharp results. Wide open at f/4, this teleconverter can produce shar image, notably in the center of the frame. As you stop down, the Sigma 120-300 lens + Sigma teleconverter combo produces some sharp images. At ƒ/5.6 – ƒ/8 the images were quite sharp, and more so in the center. Even at ƒ/16, the results are acceptable. Past that aperture however, diffraction softness becomes an issue. At 168mm (120mm + 1.4x), the chromatic aberration at ƒ/4 is pretty minor. At ƒ/5.6 with the teleconverter, the average CA is actually lower on this lens than without the TC. As you stop down, the chromatic aberration is quite dramatically reduced. At ƒ/8, average CA is less than 150th of a percent of frame height, which is very low. On the bare lens at ƒ/8, CA was almost double. At the middle focal length we tested (193 + 1.4x / 289mm), chromatic aberration is much lower at the wider apertures. Average CA dips down by a fraction from ƒ/4 to ƒ/5.6, but then increases little by little as you stop down – the opposite behavior that we see at the wider focal length, and higher CA than with the bare lens. When we zoom to the longest focal length (420mm), we see a big increase in chromatic aberration, and the largest difference between with and without the teleconverter. Both average and maximum values of CA were much higher with the teleconverter than they were without. Also, like we saw at 289mm, the CA increases as you stop down, although it's more pronounced at 420mm. The Sigma 1.4x teleconverter actually increases vignetting compared to the bare lens. With the teleconverter, it displays more corner shading at ƒ/4 than the bare lens does at ƒ/2.8. At 168mm and 289mm, wide open, we saw around 3/4th of a stop of light loss. At 420mm ƒ/4 we saw even more vignetting, with over 1-stop of light loss. Without the extender, we saw only about 1/4th of a stop of light loss at 120mm and 193mm, and about 3/4th of a stop at 300mm. As you stop down, with the teleconverter, vignetting decreases significantly, becoming barely noticeable past ƒ/11. The Sigma 120-300mm lens itself was very good at controlling distortion – the average distortion at 120mm for example was close to zero. The Sigma APO TELE CONVERTER 1.4x EX DG adds a bit of distortion, however it's very minor. At the three focal lengths we tested, barrel distortion only averaged around +0.25%. Without the teleconverter, the Sigma 120-300 was very fast and accurate to autofocus. Using a teleconverter is certainly not going to speed up AF operation, as there another electrical interface between the lens and camera. Amongst our testing of multiple copies of this teleconverter, we didn't get a chance to really try real-world AF performance. For a simple reference, over on the Canon 1.4X III extender review, we noted that Canon suggests that AF drive speed is reduced by 50% when using their 1.4x Extender. The Sigma APO TELE CONVERTER 1.4x EX DG has some useful implications in macro work, offering an extra 40% magnification without sacrificing the minimum close-focusing distance. Sigma's longer focal length macro lenses are compatible with the Sigma 1.4x teleconverter, such as the MACRO 105mm F2.8 EX DG OS HSM and APO MACRO 150mm F2.8 EX DG OS HSM. See the full list of lens compatibility here, as well as special notes for AF distances with Sigma macro lenses. The Sigma APO TELE CONVERTER 1.4x EX DG is very small, but it does have some heft to it. The extender has metal lens mounts, and the barrel is finished in a smooth matte black. The barrel feels like metal, perhaps aluminum, but Sigma doesn't specify. It doesn't have the odd Sigma "soft, rubbery" coating like a lot of their older lenses featured. It weighs 5 oz. (143 grams) and is less than 1-inch thick. 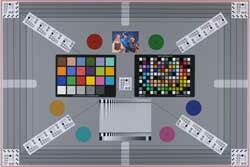 In terms of optical construction, the teleconverter is made up of five elements in three groups. It features Sigma "DG" lens coating, which is designed specifically for digital cameras, and is supposed to help reduce flare and ghosting. Due to the construction of the Sigma extender, not all lenses are compatible. The glass elements protrude out from the front of the teleconverter and subsequently fit inside the back of the telephoto lenses. Therefore, only lenses that provide enough clearance to fit this protrusion can be used. See the full list of lens compatibility here. The version III 1.4x Extender offers some slight improvement over the version II 1.4x Extender, with very slightly better results for sharpness, but much improved results for chromatic aberration. Distortion and shading results are about the same, though of course it will cost you a bit more for the version III model. The Mk.II version of Canon's 1.4X TC is available, most likely on the used market for around $230-$260. For Nikon users, Nikon has their own 1.4x extender. Although we haven't tested this one ourselves, it's quite highly rated, but carries a similarly high price tag to the Canon 1.4x III teleconverter. Another option for Canon and Nikon users is the 1.4x extender from Tamron, which provides the same 1.4x magnification but for a significantly lower price. Kenko also provides a similar third-party alternative to the big lens manufacturers' teleconverters, but has similar features, magnification for a lower price. This little 1.4x teleconverter offers substantial cost savings over the Canon and Nikon alternatives. For users who only plan on needing increased focal lengths sparingly, the Sigma APO TELE CONVERTER 1.4x EX DG could be a great option. However, given our experience with optical problems with three out of four different copies of this extender, it makes it quite difficult to recommend. If you can find yourself a good copy, then you might do ok. Otherwise, we'd recommend you look at other brands of teleconverters. Check out the manufacturer page as well as this video demonstration produced by Sigma for more information. I use this TC with the Sigma 150mm f2.8 Macro (pre-OS) on a Nikon, and the results are outstanding. Even with the D800 the ensamble is sharp enough at full aperture ("f4"), and a razor when stepped down. Almost no decay in the bokeh and absolutely no CA in any condition. This Converter is mechanically incompatible virtually with every lens but Sigma. This could be not an issue, since the compatible Sigma lenses have a particular design for mounting the TC, and the results are very high in average. With Nikon mount, Sigma has limited the AF functionality when the luminosity of the lens+TC is over f5.6. But both my D800 and D600 have an AF system that works well til f8! And also my old D2x and D700 worked well, covering the electric contact in order to "cheat" with the electronics and hide the TC to the body. Why the hell I cannot use the autofocus with my Sigma 500mm f4.5 plus the teleconverter ("f6.3" as result)? Pity, because the optical results are decent, but an MF lens of over 700mm is impractical, at least. A Very Good TC for the $$$. On my 70-200 it is as sharp as without the TC. I didn't notice any degradeing of speed or IQ. 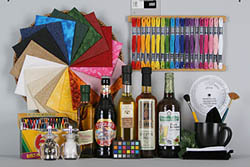 The colors are still vibrant and the contrast is still good. Sigma scores again.